Bernie Sanders’ presidential campaign has nothing to do with winning people to socialism. It’s all about getting disaffected “progressives” and youth to vote Democratic in 2016, and at most to nudge this pillar of American capitalism in a slightly more liberal direction. Sanders is well aware of his role. In 2008, Barack Obama won by feigning an antiwar stance in a country sick of the Iraq War, and by exciting large numbers of youth and African Americans with the prospect of the first black president of this country founded on slavery. Today after eight years of Obama’s administration, governing on behalf of Wall Street while continuing and escalating the U.S.’ endless war in the Middle East, that brand is well past its sell-by date. Sanders has noted that Republicans win when there is low voter turnout, and in 2014 midterm elections 80% of youth didn’t vote. So he seeks to “reinvigorate democracy” by pushing a liberal populist program spiced up with some “socialist” rhetoric and talk of a “political revolution” to attract them. Some of Sanders’ earliest backers are leftovers from the 2011 Occupy Wall Street movement, with its populist jibes at “the 1%.” (He goes them one better, attacking “the 1/10th of 1%.”) This includes the hip Marxoid Jacobin Magazine, whose initiators came out of Cold War social democracy. On the other hand, the Vermont senator’s “color-blind” economic populism has not attracted the tens and hundreds of thousands of young people and others who marched against racist police terror in 2014.1 What Sanders has done is place much of the socialist left in a quandary, as reformists and opportunists dream of having an audience in big-time bourgeois politics. Some still want to maintain a pretense of independence from the Democratic Party of war, poverty and racism. Others want to go all the way with “Bernie,” hoping to pick up disappointed Sanderistas when he endorses “Hillary” after the charade of primary elections. Genuine revolutionary Marxists and communists, in contrast, warn against the Sanders swindle. Of the social democrats who simulate a degree of separation from the Democratic Party (the DSA doesn’t even pretend), the most prominent are the International Socialist Organization (ISO) and Socialist Alternative (SAlt). The DSA is a continuator of the “State Department socialists” whose chief ideologist was Max Shachtman, who split from Trotskyism refusing to defend the Soviet Union in World War II claiming it was “bureaucratic collectivist” (and who later became a propagandist for U.S. imperialism). The ISO is an heir of Tony Cliff, who broke with Trotskyism refusing to defend the USSR in the post-WWII Cold War, labeling it “state capitalist.” SAlt is an offshoot of the Militant tendency of Ted Grant, who along with Cliffites and Shachtmanites (and most of the left) condemned Soviet intervention in Afghanistan in the 1980s. In contrast, authentic Trotskyists hailed the Soviet army in Afghanistan and, while calling for political revolution to oust the sellout Kremlin bureaucracy, intransigently defended the USSR and Soviet bloc deformed workers states against imperialism and counterrevolution. We have already commented on the pseudo-debate between SAlt and the ISO over how to sidle up to the populist Democratic candidate (“Bernie Sanders and the Pressure Politics of the Opportunist Left,” The Internationalist No. 40, Summer 2015). While SAlt has plunged ever deeper into the Sanders campaign, the ISO continues to piously wish that Sanders, the long-serving imperialist bourgeois politician, were “independent.” This hasn’t stopped these Cliffite social democrats from gushing with enthusiasm over his campaign, with article after article praising Sanders as a “breath of fresh air,” “a welcome departure from the mainstream,” saying everyone “should welcome Sanders’ praise for ‘democratic socialism’ and his frequent appeals to the virtues of Scandinavian social democracy,” that “Bernie Sanders’ call for political revolution is welcome,” etc. (See “ISO ‘Fresh Air’ Fiends of Class Collaboration”). We’ve seen this “breath of fresh air” stuff before from the ISO … over Barack Obama. When Obama, then a senator from Illinois, started making waves with his high-flown liberal rhetoric and denunciation of Bush’s “dumb war” in Iraq, the ISO quickly sensed an opportunity. It showed up at a February 2007 Obama rally in Chicago with a banner reading “Obama: Stand Up! Cut the funding!” As past masters in opportunism, they were soon repeating the Democratic candidate’s campaign slogans, plastering “Yes We Can” and “The Politics of Change or Politics as Usual” (along with a flattering photo of Obama) on the cover of its magazine, the International Socialist Review (see “The ‘Obama Socialists’,” The Internationalist No. 28, March-April 2009). Then, after Obama took office and presented his first federal budget the ISO proclaimed: “After 30 years of Republican ascendance in Washington and the retreat of liberalism at every turn, Obama’s willingness to draw the line and promise a fight for his priorities is a welcome blast of fresh air.” Obama’s priorities included the biggest U.S. military budget since World War II. Socialist Alternative likewise hailed Obama’s war budget as “a sharp break from political policies during the last 30 years” (Justice, March-April 2009). Nowadays, SAlt is all Bernie, all the time. Its other, implicitly pro-Democratic Party campaigns like $15 Now which proposed to win a $15/hr. minimum wage by legislative and ballot initiatives, have fallen by the wayside as it pushes the populist Democrat. After an initial pro-forma call to “persuade” Sanders to run for president as an independent, which he had already rejected, and saying it was a “mistake” for him to run in the Democratic primaries, SAlt dropped any pretended scruples and has been busily participating in “People for Bernie,” “Labor for Bernie” and similar efforts, while mounting the Million Student March as a pro-Sanders event. Now, in time-honored opportunist fashion, it has formed a new front group for the campaign. If the DSA has #WeNeedBernie, SAlt has set up #Movement4Bernie as its own wholly owned subsidiary to recruit out of. A statement on the website of #M4B calls to “Join the political revolution against the billionaire class,” in order to “help Bernie win in 2016, stop the right-wing Republicans and counter the Wall Street dominated Democratic Party establishment.” Similarly, it calls to “Challenge Clinton” but “Stop the Republican Right.” It even has a shout-out to “Many people [who] are excited about the prospect of having our first woman President.” So just as Sanders carefully avoids labeling Clinton the candidate of Wall Street, although she practically invited it in the first Democratic debate, Socialist “Alternative” goes out of its way to not attack the Democratic Party as such, and certainly not to denounce it or call to break from this capitalist party. With its deliberate silences and weasly formulations about “countering” and “challenging” the Democratic “establishment,” SAlt is participating in Sanders’ campaign in the Democratic primaries while cynically slithering around to avoid saying so openly. Social democrats of all denominations unite to hail “political revolution” of Democrat Bernie Sanders. Above: Democratic Socialists of America. Below: Kshama Sawant, Socialist Alternative city council member in Seattle. While these pseudo-socialists help Sanders round up votes for Democrats, Trotskyists oppose all capitalist parties and call for a revolutionary workers party. 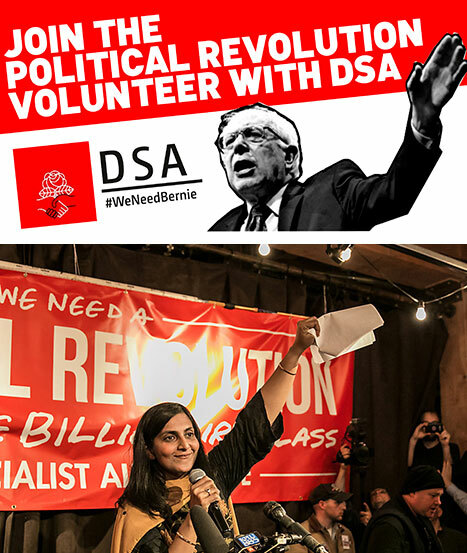 If anyone had any doubt on that score, the first initiative of this new “movement” was to publicize a letter from SAlt’s “socialist” Seattle city council member Kshama Sawant defending Sanders in a flap inside the Democratic Party over his campaign sneaking a look at a Hillary Clinton campaign voter database. The #Movement4Bernie is a get-rich-quick scheme, and SAlt has to move in a hurry, to make headway among Sanders’ supporters before the Bernie bandwagon runs out of gas a few months from now, at the latest by the Democratic convention when Sanders throws his support behind Clinton. It’s hardly a new tactic, but it marks the formal entry of SAlt into the Democratic Party. From having its supporters participate in Sanders’ campaign, it has graduated to building that campaign as an organization. Whether M4B says it in so many words or not, that fact is that the necessary first step to “help Bernie win in 2016” is getting people to vote for him in the upcoming Democratic primaries. Socialist Alternative has class collaboration written in its DNA, it’s at the heart of reformist social democracy. An outfit that considers cops to be workers, SAlt is willfully blind to the class line separating the working class and the capitalist class, pitting the proletariat against the bourgeoisie. Its entry into Democratic Party politics is a fundamental betrayal of any fight for working-class independence, the cornerstone of Marxist politics. As Karl Marx underscored in his 21 September 1871 address to the International Working Men’s Association, “Our politics must be working-class politics. The workers’ party must never be the tagtail of any bourgeois party; it must be independent and have its goal and its own policy.” In the Sanders campaign, SAlt is going beyond its usual tailing after the capitalist Democrats to direct participation. In doing so, it is feeding and even creating illusions that the cause of “socialism,” or at least its caricature of it, can be advanced through struggle within this bourgeois-imperialist party. Various other denizens of the social-democratic swamp want a little more distance between Democrat Sanders and themselves, but despite some soft criticisms, none take him on frontally. And no wonder, since the program he is running on differs little from the reformist pablum they routinely dish out. An article by David Freedlander on the Bloomberg Politics web site (13 October) quotes Steve Durham of the Freedom Socialist Party (FSP) saying of Sanders, “He isn’t an anti-capitalist! He is for reforming capitalism” (“Bernie Sanders Isn’t Socialist Enough for Many Socialists,” 13 October). The FSP criticizes Socialist Alternative for its Berniemania, but writes that “If he chose to, Sanders has the momentum and the numbers of supporters to break free from the Democrats and contribute toward launching a formidable anti-capitalist party” (Freedom Socialist, October 2015). Yet if Sanders were running as an “independent,” he would still be a bourgeois politician, defending capitalism and imperialism. The FSP proposes that various “socialist groups … increase their impact in the electoral arena by joining together with a common platform.” But the reformist common ground these social democrats share with each other (and with Sanders) is precisely the illusion of reforming capitalism, as the bourgeois populist SYRIZA (Coalition of the Radical Left) party proposed to do in Greece. It was an utter fiasco, for which Greek working people paid a heavy price. 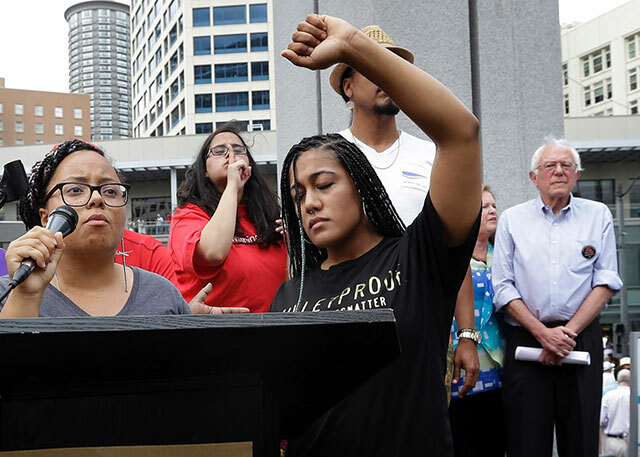 Socialist Action (SA), for its part, counsels leftists to sidestep the Sanders campaign and keep on with antiwar, anti-racist (Black Lives Matter), environmental and women’s rights protests, with the aim of building a “labor party” (“Bernie Sanders & the Labor Movement,” Socialist Action, 5 September 2015). Yet to avoid the common fate of such movements of being co-opted, sucked into the Democratic Party and defeated, it is crucial to directly oppose the Democrats and to oust the pro-capitalist bureaucrats in a struggle to build a revolutionary workers party. “Does it make any tactical sense, if you want to truly popularize socialism with the millions of new Sanders supporters who are supporting him precisely because they want change and see a ‘socialist’ candidate as the vehicle for change, that they are just really wasting their time or worse? “No, it does not make sense. Perhaps it is a psychological fear by small fish who have been comfortably swimming in small ponds for so long that they fear the scary waves and powerful currents of larger bodies of water or simply being swallowed up by the bigger fish. Or, in the case of some very militant and radical young people who are unfamiliar with the crushing suppression of the socialist and communist left in the U.S., they are understandably turned off by and not seeing past Sanders’ liberalism…. The article praises Sanders’ reform proposals, not surprising since it overlaps with the electoral reformist program the PSL runs on. And, given the “surprising popularity” of his campaign, Becker lectures those “very militant and radical young people” (including PSL youth, perhaps?) to make nice with Sanders supporters and pressure them to pressure him to run as an independent – the same line as the social democrats. “Sanders isn’t a socialist. Socialism must be defended from the misleading confines of the capitalist elections…. “Sanders has been useful to the ruling capitalist class, even though they don’t reward him for this. His campaign hooked the growing number of disaffected workers back into the Democratic Party with his commentary on issues such as the lack of affordable health care and the predominance of low-wage work…. Indeed. So what is socialism? The WWP and PSL Marcyites identify socialism with Stalinist regimes like Fidel Castro’s Cuba. Genuine revolutionary Marxists (Trotskyists) defend those bureaucratically deformed workers states against imperialism and counterrevolution. At the same time we insist that they cannot lead to genuine socialism without a proletarian political revolution to oust the narrow nationalist bureaucracy, establish soviet democracy and extend the revolution internationally to the imperialist centers. The ISO, SAlt and sundry other social democrats, on the other hand, see socialism as a “welfare state” writ large, with more extensive nationalizations than in Sanders’ favored Scandinavian model, but without socialist revolution to smash the capitalist ruling class and its state. Neither Stalinism nor social democracy (and much less Sanders’ New Deal liberalism) represent socialism as envisioned by Marx, Engels, Lenin and Trotsky who fought for international socialist revolution to prepare the way to a communist society. The basic argument of the pseudo-socialist “Bernie boosters” of every denomination is that Sanders’ candidacy, even though running in the Democratic Party – that elephant’s graveyard “where social movements go to die,” as one DSAer, of all people, accurately described it – opens a “discussion on what socialism is” and “popularizes socialism.” Besides, the platform he’s actually running on coincides pretty much with their own reformist minimum programs. Yet what Sanders is advocating is precisely what socialism isn’t. And what he’s doing in the concrete is trying to rope people, particularly young people, into voting for the Democratic Party of racist police terror and imperialist war, which is presiding over the obscene enrichment of the capitalist class at the expense of poor and working people, which is deporting millions of immigrants, the party whose hold over labor and minorities must be shattered on the road to socialist revolution. 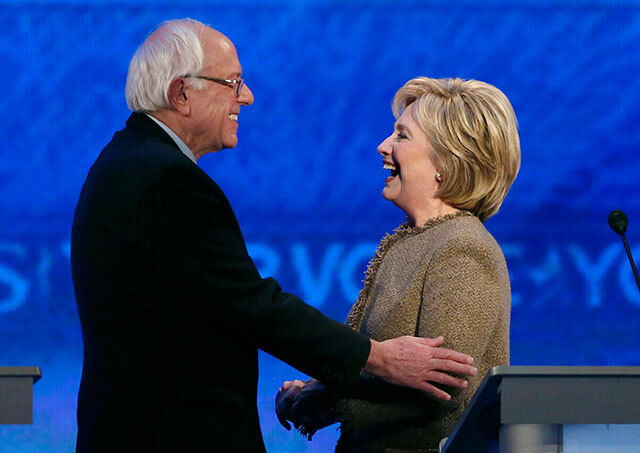 Is Sanders “popularizing socialism”? Not really. There has been a notable change in popular attitudes toward socialism in recent years, before most people had ever heard of Bernie Sanders. This is borne out even in rigged opinion surveys. When his candidacy was picking up steam, the Gallup polling organization added a question about whether respondents would vote for a socialist if their party ran one. The media duly reported that socialist was the most unpopular of all categories, that less people would vote for a socialist than for a Catholic, a woman, a black, a Hispanic, a Jew, a gay or lesbian, a Muslim or even an atheist. But when you look at the stats, what it showed was that 47% would vote for a socialist, and among young people ages 18 to 29, nearly seven in ten would vote for a socialist. A 2010 poll Gallup poll reported that 36% of Americans viewed socialism favorably, and a 2011 Pew poll found young people favored socialism over capitalism by 49% to 43%. So things have changed somewhat from the past when calling someone a socialist was a drop dead swear word. This is primarily the result of the economic crisis of 2007-08 and the ongoing depression, with its mass unemployment – disguised by official statistics but acutely felt by youth who can’t find a job, no matter what. Less and less people believe in the bogus “American Dream” of getting ahead by working hard, since workers today make less than what they earned four and a half decades ago. It may also have to do with a reaction against a right wing which incessantly labels Obama a socialist (as well as a Kenyan, Muslim, etc.). What Sanders’ candidacy is doing is not making “socialism” more popular, but making it more respectable in polite bourgeois circles. But those who really fight for socialist revolution and for communism are never going to be respectable in bourgeois society. The ruling class and their media will treat genuine communists and revolutionary socialists as their implacable enemies, which we are. 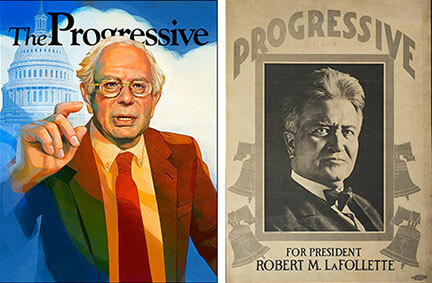 Bernie Sanders on 2013 cover of The Progressive magazine, founded by Robert LaFollette who ran for president as candidate of the Progressive Party (which he also founded) in 1924. Politically supporting bourgeois “progressives” is counterposed to building a revolutionary workers party. So how do we get from here to there, from today when political power is monopolized by the two partner parties of American capitalism to the direct fight for revolution? The key is to develop the class consciousness and political independence of the working class from the bourgeoisie. The response of reformist pretend socialists is instead to promote “third parties,” minor bourgeois parties like the Greens today, the Progressive parties in the 1910s and ’20s, and Farmer-Labor parties in the ’20s and ’30s. Such parties act as pressure groups on the major capitalist parties, mainly the Democrats, and most disappear after having served their purpose as an escape valve to blow off the steam of popular discontent. This is what the left-wing Bernie boosters are aiming at when they beg him to go “independent.” That will do nothing to develop class consciousness and would in fact be a roadblock to revolution, just as campaigning inside the Democratic Party for dissident “progressives” is. “The ISO and other reformists are fond of talking about an ‘alternative,’ appealing to those who would like a more ‘progressive’ leadership of the Democratic Party. Their role is to sucker young people back into the shell game of capitalist electoral politics. For Marxists, it is not a matter of picking between ruling-class ‘lesser evils,’ but building a revolutionary party that tells the truth. The truth is that all bourgeois politicians are our enemies…. ISO and SAlt campaigned for immigrant-bashing candidate Nader. Social democrats and other reformists call to vote for “independent” bourgeois politicians and “third parties.” Today the ISO holds up the example of Ralph Nader as a model for what Bernie Sanders could/should do. But all capitalist politicians and parties are enemies of the working class. 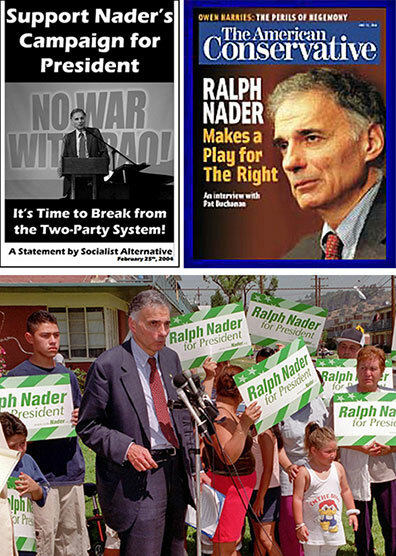 When Nader ran for president on the Green Party ticket in 2004 (bottom), ISO and SAlt backed him, as did the far-right Reform Party of the fascistic Pat Buchanan, publisher of The American Conservative. Nader had common ground with right-wingers in opposing “illegal” immigration. Chasing after “progressive” capitalist politicians: it’s what opportunist pseudo-socialists do. And they do it time after time, because it leads nowhere, and certainly not to revolution. If they do ever manage to get together on a common reformist program, it could be called (paraphrasing Trotsky’s label for another unprincipled lash-up) as the League of Pre-Squeezed Lemons. It shouldn’t be all that hard to oppose a somewhat-popular bourgeois presidential candidate. Relative to other tests that face those who would be proletarian revolutionaries, class opposition to the Democrat Bernie ought to be a no-brainer. Class-conscious workers and defenders of the oppressed won’t forget which “socialists” buckled under the featherweight pressure of the Sanders fad: such people are not serious. They rounded up votes for the party of war in Iraq and Syria, for the party whose mayors are the bosses of the racist killer cops from coast to coast. They can’t be trusted, who knows where they will turn in their next maneuver. 1.See “Capitalism’s Racist Electoral Circus Is Back,” The Internationalist No. 41, September-October 2015. 2.This was dramatically demonstrated by recent events in Greece. Despite the January 2015 election victory of a bourgeois populist party, SYRIZA (the Coalition of the Radical Left), on a program of opposition to austerity, and a July 5 referendum in which over 60% voted against the vicious austerity demands of the European central bankers and the International Monetary Fund, it was the bankers who prevailed. See “Greece: The Naked Rule of Finance Capital,” The Internationalist No. 41, September-October 2015. “The traditional two-party system in the United States has been very well suited for normal times. The ruling capitalists couldn’t ask for anything better than this system which absorbs shocks and grievances by shifting people from one bourgeois party to another. But that system can blow up in time of crisis. The aggravation of the crisis which we all see ahead can shake up the whole American political situation, so that the old two-party system will no longer suffice to serve the needs of the American bourgeoisie. “The less it becomes possible to mobilize the workers’ votes for one or the other of these two old bourgeois parties, the more impelling and powerful will become the urge of the workers to found a party of their own or to seek a substitute for it. That mood of the workers will create a condition wherein American capitalism will objectively require a pseudo-radical party to divert the workers from a party of their own….